Andy's Forum > Categories > ALTERNATIVE HEALTH > Does MesoSilver cause Argyria? No, MesoSilver does not cause Argyria. Argyria is a discoloration of the skin wherein the skin turns a blue-grey color as a result of over exposure to certain forms of silver. Argyria is known to be caused by ingesting; 1) silver salts (compounds) such as silver nitrate, 2) high concentrations of ionic silver, 3) protein based silver products aka "silver protein" or "mild silver protein", 4) Inhalation of high concentrations of silver dust as found in silver mines and silver refining operations. By now nearly everyone has seen the story about Paul Karason who the news media has dubbed "The Blue Man". Although the news media has continually said that he was taking colloidal silver, nothing could be further from the truth. The Blue Man story became a major media disinformation event which was produced by a public relations firm and paid for by a pharmaceutical interest. The purpose of this campaign was to scare the public away from using colloidal silver products. The tactic was to claim that the Blue Man's condition was caused by his use of colloidal silver thus implying that anyone who uses colloidal silver would suffer a similar fate. The entire story as presented is a study in blatant misrepresentation. 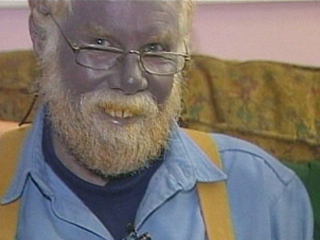 The fact is that Paul has a condition called argyria that turns the skin a blue-gray color. He got this condition by taking his homemade silver compound that was mostly a highly concentrated ionic silver solution. When he prepared the solution he believed he was making colloidal silver. He was not making colloidal silver. To make the solution even more dangerous, he added salt to the brew and then used electrolysis to make a high concentration of silver chloride with large particles which is well known to cause argyria. He further applied the compound to his skin causing him to become an internal and external photographic plate. To finish himself off, he used a tanning bed to "fix" the silver in his body. The Blue Man charade demonstrates once again that the mass media cannot be trusted to report anything that even resembles a truthful "news" story. All "news" today is propagated with an agenda just like the phony economic statistics put out the U.S. government.